Marine aquariums and saltwater fish... capturing the imagination and inspiring enthusiasts for nearly two centuries! The world's oceans are inhabited with over 14,000 species of saltwater fish. A fascinating realm of sea creatures that are natural wonders of color, form, and display. With such an astounding diversity, learning about marine fish and keeping saltwater aquariums is an exciting adventure. Our list of saltwater fish covers a wide array of species from marine aquarium fish to exotic species. Each fish guide offers salt water fish information starting with where they are found and their habitat, followed with fish care, behaviors, and compatibility. Fish pictures are provided with each guide to help choose a pet and aid as a fish identification guide. - Clownfish are named for their clown like appearance and adorable 'waddle-like' swimming motions, they are truly the clowns of sea! - Damselfish are very colorful, active small fish that are extremely hardy and adapt easily to the aquarium. - Saltwater angelfish are truly an inspiration for many aquarists. Their majestic beauty is rivaled by few other types of fish. - Blennies are long, blunt headed fish. The male blennies are usually larger and more colorful than the females. Blennies like to perch in the rocks and will enjoy an aquarium with plenty of rockwork or live rock. - Butterflyfish are some of the most beautiful and exotic of all the reef fishes, though often harder to keep in an aquarium because of their specialized diets. - Gobies live in holes either found or dug from the sand which serve as a place to bolt into when danger is near, while the Dartfish or Dart Gobies swim above their protective caves. - "The name comes from their hawklike hunting behaviour." - Mandarinfish and Dragonets are mostly bottom dwellers. They often like to bury themselves in the sand or flit from rock to rock in search of the small animals they like to feed upon. - "The romans valued morays very highly, docorating them with jewels"
- Saltwater fish that are not represented by a large number of species. Many of these marine fish make wonderful additons to the marine or reef aquarium. - Puffers, Boxfish, and Porcupinefish are considered hardy in the sense that they will almost always adapt to aquarium food if fed proper foods. These fish love to eat will often look forward to seeing the person that feeds them. - "When the Betta hunts it approaches its prey sideways ..."
- Sharks and Rays can be incredible additions to aquariums that are large enough to suit the particular species. Unfortunately most of them are too large for anything but a public aquarium. - Saltwater Tangs of the Acanthuridae family are known as "Surgeonfish" because they have razor sharp spines at the base of their tail fin. - Members of this family have acquired their common name 'triggerfish' from the characteristic locking and unlocking of their first dorsal fin. - Wrasses come in a wide assortment of colors, shapes and sizes. They are very beautiful and a fun addition to marine aquariums. 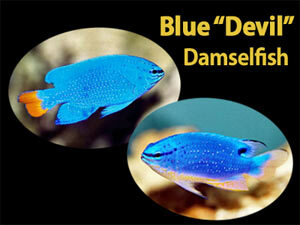 The Blue Devils, stunning but pugnacious damsels! Many of the Chrysiptera damsels are lavishly colored, but the two Blue Devils top the list of favorites! The splendid, eye-catching appearance of these Blue Devil's simply can't be ignored. Despite having a bit of the "devil" in their personalities, these two damselfish are extremely popular . . . The Bicolor Parrotfish has three growth phases. This video shows the terminal (adult) phase. The juvenile is white with an orange bar covering the front part of the fish except the snout. This fish can reach up to 36 inches in length. They are found in the Indo-pacific, Red Sea to Tuamotus and the southern portion of the Great Barrier Reef. They are almost impossible to keep in captvie environments because of their large size and herbivorous diet. In the wild they eat the algae that grows on dead coral skeletons. Their specialized teeth are well adapted to scraping coral skeletons as seen in this video. In the aquarium they will do the same thing but since most reef aquariums don't keep dead coral skeletons, they will turn on live corals and destroy them. The keeping of saltwater fish species is infrequently recorded in ancient history. It wasn't until the nineteenth century that a real push began to explore the inhabitants of the sea. In the early 1800's successful keeping of marine invertebrates is cited, but keeping marine fish developed a bit later. The first successful collection of saltwater fish, and then successfully keeping saltwater aquariums is credited to William E. Damon in the 1870’s. Still it wasn't until almost a century later, about the 1950’s, that interest in the hobby really began to take root, and by the 1980’s, major strides were made in aquarium husbandry. At this time how to biologically maintain an artificial ocean environment was developed, what today is commonly known as the nitrification cycle. With this development, saltwater fish keeping became very successful and is an exciting widespread hobby today. Animal-World fish guides provide information on many types of saltwater aquarium fish and others. The list of fish includes all types of marine fish from well known popular species like Damsels, Angelfish, and Tangs, to the more exotic marine species like Sharks, Rays and others. The list of saltwater fish is constantly expanding to include even more exotic fish types like Anglers and Toadfish, Grunts, Jawfish, Seahorses and Pipefish, Tilefish, Snappers, Scorpions, Rockfish, and more. Fish pictures of each type of marine fish are provided within each fish guide. These not only help with saltwater fish identification, but aid in choosing pet fish. The fish guides also have in-depth fish information, covering everything from their native place of origin and when first scientifically described, to the habitats and behaviors of each species. Each guide then provides the fish care needed to successfully keep them in a saltwater aquarium.